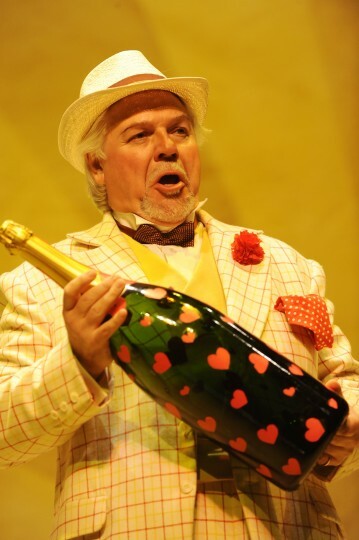 Full of colourful characters, Donizetti’s deliciously frothy tale of romance has delighted audiences throughout the world. A shy young farmer loves a beautiful landowner. She possesses money, education and sophistication, he doesn’t. They’re worlds apart and his unrequited love looks like it will never be reciprocated. That is until the day a travelling salesman breezes into the village selling a magic elixir, and then the fun really begins. The Elixir of Love (L’Elisir d’Amore) featured beautiful 1920s costumes by Gabriella Ingram and an ingenious set by Gary McCann, setting it in the uniquely beautiful village of Clough Williams-Ellis’s Italianate fantasy village of Portmeirion, North Wales. 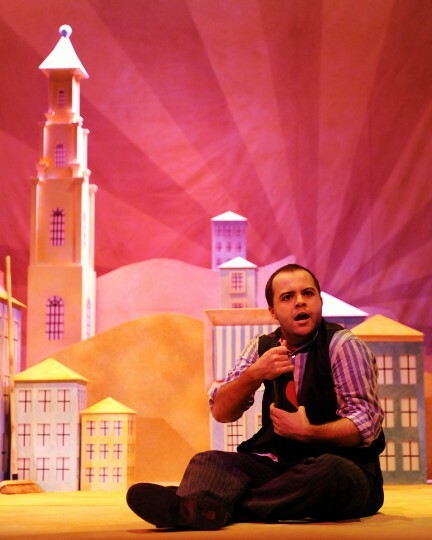 The Elixir of Love toured to 25 venues across the UK conducted by Fraser Goulding. 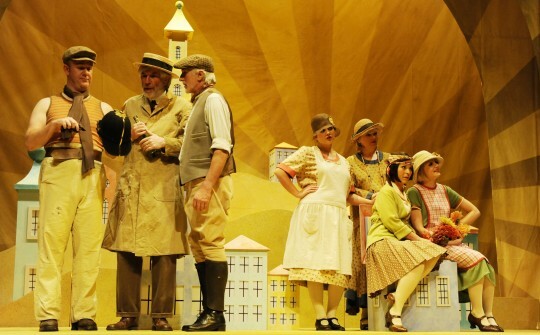 Translating the text into English, with a reduced chorus and orchestra and transposing the action from Italy to Portmeirion in the 1920s, left a great deal of scope for this production to fail dismally. Instead, it was a triumph in every respect. 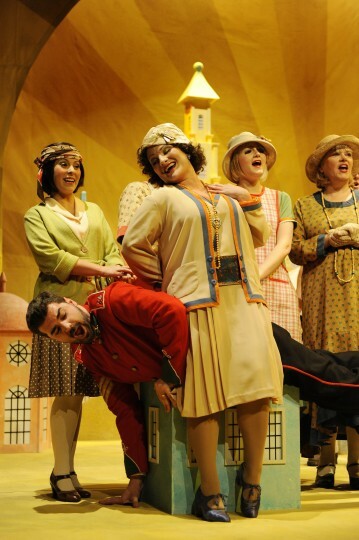 SCO bring high quality opera to theatres which are too small or remote to receive even slightly larger companies, and give audiences the chance to hear opera as it should be heard, with excellent singers and musicians, and with unpretentious but satisfying direction. This was a great evening of entertainment and music, thoroughly enjoyable and to be unreservedly recommended. The translation was witty and engaging and was audible owing to the singers’ excellent diction; the orchestral arrangement (by conductor Fraser Goulding) was masterly and the singing itself was a delight. Placing the action in North Wales made next to no difference to the story and made no demands on audience credulity. Gary McCann’s set design used the architecture of Portmeirion in miniature, achieving a setting which never intruded but which was very effective in giving an unmistakeable and attractive context for the action. 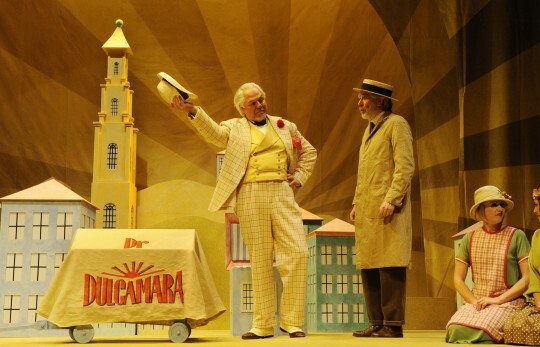 Joint Artistic Director of Swansea City Opera Brendan Wheatley was, as ever, in good form as Dulcamara – every inch the wily quack needing a fast getaway when his remedies fail to work. He was clearly enjoying himself immensely on stage as well as being in his customary good voice, and his spiv’s get-up was one of the most appropriate costumes I have seen in years: beautifully cut, loud as you like and a magnificent symbol of his character’s…well, character. Skilful casting ensured that the other leading parts were taken by extremely impressive young singers, all of whom were not only a pleasure to hear, but who should all develop into even better artists than they already are. The most immediately impressive was Robert Davies as Beadden/Belcore. From his first appearance as the slightly seedy Sergeant, his voice was warm, accurate and elegantly beautiful and given that he’s a baritone who started out as a tenor, curiously reminiscent of the basses László Pólgár and Alfred Reiter. His is certainly a voice I should like to hear again. Rebecca Ivey (Angharad/Adina) was another voice with a much promise, as was Gareth Huw John (Arianwyn/Nemorino). Both showed vocal strength and beauty of tone throughout their demanding roles, and brought an energy and enthusiasm to their characterisations which is one of the great strengths of this company. Ivey’s acting was perhaps a little uncertain, but this was more than compensated for by her vocal skill, while Gareth Huw John was very likeable as the naïve young man in love with the unattainable girl of his dreams. Katherine Jane Bagshawe as Gwenllian also has a voice of impressive clarity and charm. As always, the six member chorus and the small cast managed to produce what seemed to be a huge amount of sound for so very few people, and tackled the complexities of the ensemble singing without either problems or inaccuracies. Under the direction of Fraser Goulding, singers and orchestra produced a performance which was a great pleasure to hear. It was a tribute to the skill of the whole team, first in selecting an appealing work and then in reducing it for production in very limited settings. The work of Swansea City Opera in this regard cannot be praised too highly. They bring high quality opera to theatres which are too small or remote to receive even slightly larger companies, and give audiences the chance to hear opera as it should be heard, with excellent singers and musicians, and with unpretentious but satisfying direction. This was a great evening of entertainment and music, thoroughly enjoyable and to be unreservedly recommended. Go to see it if you possibly can. I really enjoyed this sparkling, imaginative production! The quality of the singing, acting and general musicianship was excellent! I was spellbound all evening and I didn’t want it to end! Excellent singing – super diction! Very good orchestra playing. 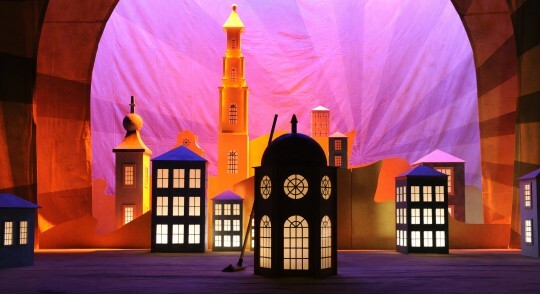 Attractive well-designed and lit set. Well costumed. Well acted. A thoroughly satisfying evening!! High standard of individual performances, good orchestra and sound balance. Fine set design, and an innovative setting. We think that acoustically the Epsom Playhouse is one of the best auditoria in the South East and really suits your productions. Please keep coming back. All this and tickets at sensible prices! A pleasure to listen to. This is one of my favourite comic operas and with your usual skill you made it even funnier than usual. 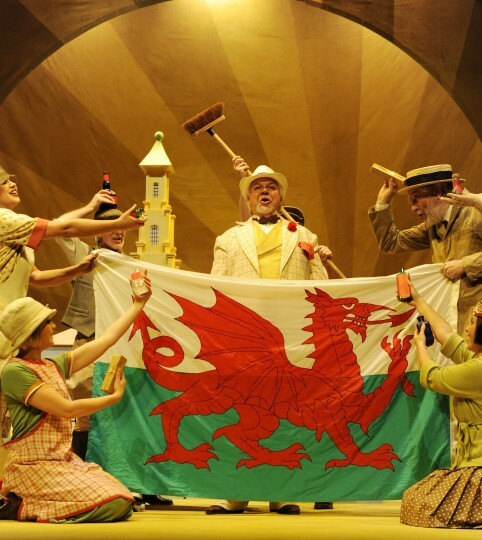 We loved the adapted translation with it's amusing Welsh asides, the lovely setting in Portmeirion and of course most of all the superb singing and orchestral accompaniment. Thank you all for a great evening and very best wishes for the future. Beautifully staged production. Quality of singing and instrumental ensemble a revelation. Best production I have seen here.